Function: Lymphocyte inhibitory receptor which inhibits lymphocytes during immune response. Subunit Structure: Interacts with tyrosine phosphatases PTPN6/SHP-1 and PTPN11/SHP-2. Interacts with TNFRSF14/HVEM. Post-translational Modifications: Phosphorylated on Tyr residues by TNFRSF14 and by antigen receptors cross-linking, both inducing association with PTPN6 and PTPN11. N-glycosylated. 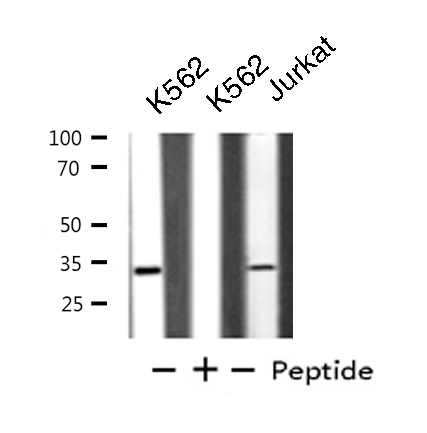 Western blot analysis of extracts from K562/Jurkat cells, using BTLA antibody. MBS9606266 staining Hela by IF/ICC. The sample were fixed with PFA and permeabilized in 0.1% Triton X-100, then blocked in 10% serum for 45 minutes at 25 degree C. The primary antibody was diluted at 1/200 and incubated with the sample for 1 hour at 37 degree C. An Alexa Fluor 594 conjugated goat anti-rabbit IgG (H+L) Ab, diluted at 1/600, was used as the secondary antibody. 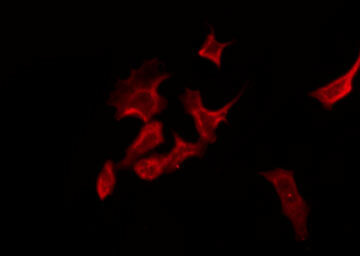 Lymphocyte inhibitory receptor which inhibits lymphocytes during immune response. 1. The genetic variants of rs76844316 in BTLA influence the susceptibility to severe chronic hepatitis B and might play a protective role against the progression of chronic hepatitis B.